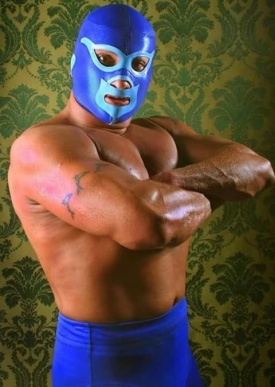 His first appearance at the young age was a pretty famous one as he entered the ring after Máscara Año 2000 had unmasked his father and swore he would get revenge one day. He was the one who removed his father's mask, but he refused to give it Máscara Año 2000 and put it on. He is found working in main events in the independent circuit in México. He had traveled in independient promotions in the United States, Japan, tours in Europe, Central and part of South America. He received an invitation to participate in Michinoku Pro Wrestling's Fukumen World League 2003 along with Atlantis. .
Trainer of new generations of wrestlers in the Anibal Gym. 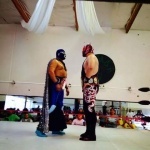 (1) Cage match with Fantasma Jr., 911, El Hijo Del Cien Caras, Fantasma de la Opera, Tinieblas Jr., Fuerza Guerrera, Multifacetico and Máscara Año 2000 Jr. This page was last edited on 1 October 2018, at 08:22.